Poetry, at its core, seems to function as a reaction to the sheer intensity of the world. Often, it’s an attempt to capture the beauty of something, as with Wordsworth and Frost; at other times, poetry can be used to describe the squalor and despair of the world, as with Bukowski and Waits. Poets take what they see around them and compress it down into verse: a strange, almost stilted style of writing that isn’t quite prose at all, but something wholly different. It feels almost ancient and mystical, religious, almost. The world human beings inhabit is such a complex, multifaceted, and yes, even mystical place that it deserves nothing less than poetry to describe it. Mere prose is not enough. In terms of capturing the world, Terrence Malick is cinema’s foremost visual poet. Malick’s 2011 masterpiece, The Tree of Life, was likened by many to a sort of visual poem for its fragmented, juxtapositional structure. This assertion is undeniably true, however, it applies to more than just Malick’s visual style. Even from his comparatively straightforward debut in 1973, Malick appears to have tackled cinema with the mindset of a poet-philosopher. Badlands was focused primarily on the story of two teenagers who whisk themselves off on a cross-country spree of violence and love, unadulterated. Malick’s taste for striking, pulchritudinous visuals was present even this early in his career as can be evidenced by the numerous lingering shots of the desolate, desert landscape much of the movie takes place in. 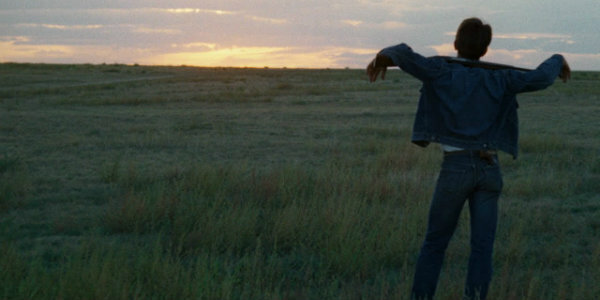 At the same time, another idiosyncrasy of Malick’s was beginning to incubate: his penchant for heady, poetic dialogue. Malick seemed constantly infatuated with the natural world. and poetic visuals were not enough. He, like nearly every human being who ever lived, needed to express his awe in words. At first, Malick’s dialogue was somewhat naturalistic, adapting the often lower class vernacular of his characters to the dense philosophical ideas he wanted to convey. For example, the opening lines of Badlands, which would seem almost novelistic and strange if not for Sissy Spacek’s affected midwestern delivery. Speaking of her father after her mother’s death, Spacek says, “He tried to act cheerful but he could never be consoled by the little stranger he found in his house.” Her whole opening monologue seems somewhat off, but the dreamlike, stupefyingly different atmosphere of the film eschews any feelings of uncertainty one might have about the screenplay. With Days of Heaven, Malick was again working in the same kind of rural, midwest farmer poetry as he was in Badlands. Lines like, “Nobody’s perfect. There was never a perfect person around. You just have half-angel and half-devil in you,” could come off as stilted or even laughable, but Malick manages to make it all work because it fits within his worldview. Both the good and the bad are too good and too bad to be talked about regularly. After Malick’s famed two decade absence from filmmaking, he came back with the excellent, non-traditional war film The Thin Red Line. Malick’s styles were beginning to shift in another direction, but this did not become truly apparent until his 2005 period epic, The New World. Malick had always flirted with abstraction and the avant garde, but with his “Pocahontas film,” Malick began to fling himself into the purely poetic with a full, heart-wrenching speed. Malick’s use of visual montage becomes more pronounced with this film, and his use of language begins to follow suit. Gone are his lengthy Sissy Spacek monologues that, despite their wordiness, do feel grounded in real life. In its place is this earnest, almost flowery dialogue that almost seems pretentious, except for something to be pretentious it has to put on a pretense. What makes Malick’s films so great, his newer stuff especially, is that they seem to lack any pretense at all. The entire film, from the dialogue to the celluloid, seems to be wrought from the confines of his the man’s consciousness. Malick’s characters are as in awe of the natural world around them, and cannot react in any way other than with inquisitive, philosophical language. “There’s something I know when I’m with you that I forget when I’m away,” says Colin Farrel’s John Smith to Q’orianka Kilcher’s Pocahontas. It seems as if Smith doesn’t even entirely know what he’s saying, and that’s okay. He’s trying to explicate his feeling of love for both Pocahontas and the new, dazzling world around him. People cannot talk of love without at least somewhat taking refuge in poetry and florid language. Malick is no different. In 2011, Malick’s love affair with the world reached an astounding fever pitch with The Tree of Life. With the epic about family and existence, he totally eschewed traditional narrative structure and in doing so did away with traditional dialogue as well. The themes and currents Malick was working with simply could not be bound by usual language barriers. His characters ask “Why?” and “How come?” They espouse and question and wonder out loud and damn it, it works. For what else can anyone do in the face of life itself but espouse and question and wonder? Malick even opens the film with a quote from the book of Job, reading “Where were you when I laid the foundation of the Earth? When the morning stars sang together, and all the sons of God shouted for joy?” It is all steeped in a wondering, a poetic questioning for all that is and ever shall be. Malick’s gradual shift from traditional, albeit distinctive, filmmaking, to something in a class all its own can be signified not only from his visual changes, but his dialogue changes as well. Everything seems to have become more strange, perhaps even less true to real life. How does it work so well? Malick was never intent on capturing real life objectively, for reality isn’t really objective at all. Both The Tree of Life and To the Wonder function primarily as memories. Characters are looking back at significant periods of their life (childhood, a past relationship) and wondering why things eventually came to the crossroads that they did. When people remember, things are clouded by a myriad of emotions and different feelings spread across time. No one remembers anything exactly as it happens. Malick was an MIT philosophy professor before he became a filmmaker, so he understands this kind of thing much better than most people. He portrays the world, and the people who inhabit the world, as sort of fragmented aspects of a memory, his memory. The way he communicates with the memory is through questioning and wonder, through a lens nostalgic but not naive. He’s trying to sort out the world the best way he can and is doing so through his own thoughts and remembrances. The films of Terrence Malick capture life as he sees it, in all its intensity. He wants to show everyone how the world, how life, appears to him. How else could he do so, but with a kind of poetry?